Stuck in a recipe rut? Looking for something delicious, easy and CHEAP? Try this EASY Asian Rice Recipe, guaranteed to become a family favorite! Our kids complained recently that we are in a food rut. When that happens, I know it’s time to pull out a travel inspired recipe. While on the hunt for a quick congee recipe (Cantonese rice porridge), I realized it takes too long to cook. Then, I discovered this three ingredient wonder from Japan called tamago kake gohan. The recipe calls for raw egg, something I don’t like, so I modified it, using an egg cooked over easy. 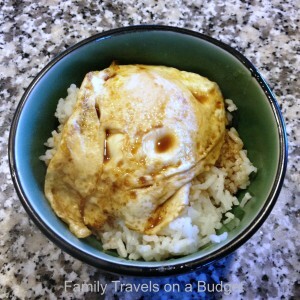 It has no name, so I’ll call it like it is: Asian Rice Recipe with egg and soy. Spoon cooked rice into bowl. Lay cooked, unseasoned egg over top. Drizzle with soy sauce to desired taste. Enjoy! Yes, it’s that simple! Don’t over-think this recipe. Double up the eggs (two per serving) and serve with fresh fruit for a simple, wholesome meal for the whole family and still dine for less than $10! My only problem is this dish needs a better title. Asian Rice Recipe with Egg and Soy is just too long… Any suggestions? If you have an easy travel inspired recipe, like my quick Asian Rice Recipe, please share! Oh, that would definitely make it difficult. This looks like something I should try. We never make anything with rice, so I know this would get us out of our dinner rut! We have rice often. I usually make extra. Then, when I want this dish, I just reheat the rice and add the egg. Quick! Yum – what an easy yet flavorful dish. And only 3 ingredients is awesome!! I had it again for lunch today, and added a dash of orange juice to the soy. Four ingredients, still easy and yummy! That’s great that you found recipes to use from places you’ve traveled! I will have to give this one a try. Looks yummy! How about Ellie’s ___ Asian Rice. You are so creative, you or one of your readers will figure out the perfect name! We’ll have to try this. I really got to enjoy rice when I was in China. Me too. Though, I was surprised that noodles are more the norm in northern China. I lumped the entire landmass into one giant rice pot! Amazing what we learn through travel. I’ve been on a fried rice kick recently and this looks like something else I’d really like. I think I’ll try it today. Yummy! No idea for the name, though. I’m never good with coming up with cute titles lol. This looks really yummy! I love easy recipes! Thank you so much, I’m going to have to give this a try! Looks delicious! I love your new photos at the top of the page too. The page looks great!